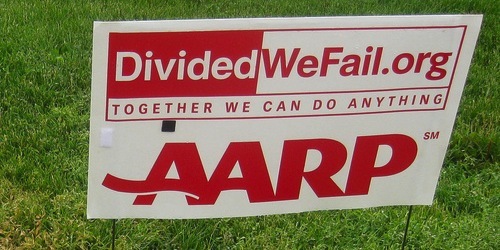 If you’re an AARP member, listen up. Chase has teamed up with the organization to offer a great credit card deal to members over the age of 50. It’s actually available to non-AARP members and individuals under 50, but I believe it’s geared more toward that crowd. First and foremost, the new “AARP Signature Visa Card from Chase” comes with a $100 cash back opening bonus when you spend $500 within the first three months of account opening. This is a similar opening bonus to the one offered with the Chase Freedom card. But what really separates the AARP credit card from the pack is the year-round cash back categories. Instead of dealing with categories that rotate each quarter, the AARP Visa Card offers 3% cash back at gas stations AND at restaurants all year long. And we all know retired folks like to go out to eat a lot…and probably drive to wherever it is they’re going. Additionally, there are no limits on how much cash back you can earn, unlike other cards that limit the amount of cash back (e.g. Blue Cash Everyday). You also get 1% cash back on all other purchases, so if you spend a decent amount each year, you can rack up the cash back with this card. For a cardholder who spends $2,000 a month on the AARP Visa Card, they’d be looking at cash back of $34 a month, and over $400 a year. And that’s all without an annual fee, which is a pretty good deal. There are a variety of redemption options for points earned via the Chase AARP credit card. The most popular option is probably cash back, with both a statement credit and an electronic deposit into a checking or savings account a possibility. Points are valued at a penny each, so 10,000 points is worth $100. You can also use points earned to renew an AARP membership, including a one, three, or five-year membership. Gift cards are also an option, per usual, and I believe points get a penny apiece value here, which isn’t bad. Finally, you can redeem points via the Chase Travel Center and actually get a slightly higher redemption rate of 0.0112 cents per point. In other words, 20,000 points are worth $224 towards travel, as opposed to $200 when redeemed for cash. Just make sure the travel options are cheaper via the Chase Travel Center or it could be a waste of your points. What Else Does the Chase AARP Credit Card Offer? Every now and then, the Chase AARP Visa Card will be offered with 0% APR for 12 months on both purchase transactions and balance transfers, though there is a 3% fee for BTs. After that, the credit card APR will rise to a much higher variable rate, which ranges based on the prime rate. There is a 3% foreign transaction fee if you use the card abroad, which is certainly a drawback, so you may want to go with a card that doesn’t charge such fees when traveling. However, Chase offers an additional point for each dollar of airfare or hotel accommodations booked via their toll-free travel redemption number. So you can earn double points on travel as well, which is a nice bonus. – Price protection – find a lower price in 60 days and get up to $250 of the difference refunded. – Purchase protection – if your item is stolen/damaged within 60 days, get up to $250 reimbursed. – Return protection – if the store won’t take it back, Chase will reimburse up to $250 for eligible returns. – Extended protection – double the warranty of the products you buy with the card. As you can see, the AARP Signature Visa Card from Chase is a pretty nifty deal. Not only do you get a decent opening bonus, but you also get great cash back categories that never rotate. Additionally, there is no annual fee and sometimes 0% introductory APR for the first year. Finally, you get all that added purchase protection, which is clearly geared toward AARP members who demand more piece of mind when using their credit cards. For the record, Chase is the only card issuer with credit cards endorsed by AARP, which certainly isn’t an easy accomplishment. In other words, if AARP approved it, you’ll likely find that it’s up to snuff as well. Tip: You don’t necessarily have to be a member of AARP to apply for this credit card. The 3% cash back at restaurants year-round is the best offer I’ve seen. I’ll have to tell my parents about this card.